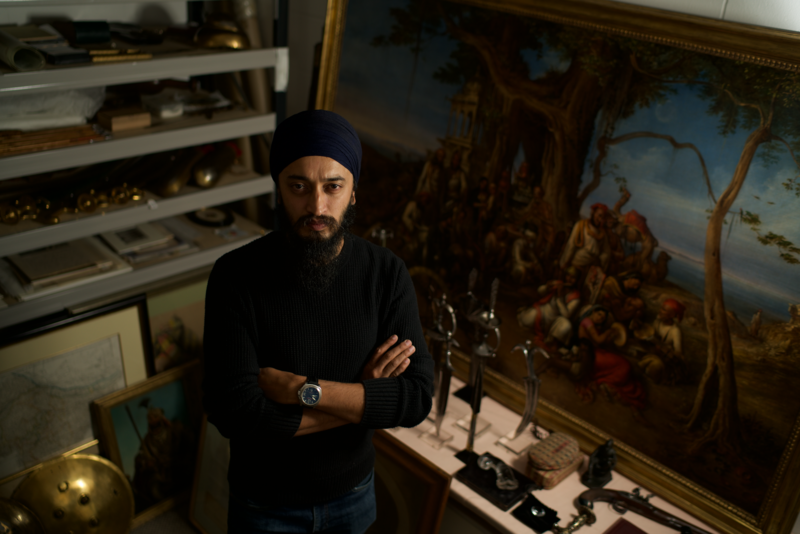 Davinder Toor was only eighteen when his deep-seated passion for art led him to volunteer at the Victoria & Albert Museum's ground-breaking exhibition on Sikh Art just before his University started in 1999. The 'Art of the Sikh Kingdom' was an eye-opener for the medical pharmacist from Watford which became an inspiration for him to trace the heritage of Maharaja Ranjit Singh. Two decades on, Davinder continues his journey of discovering the 'stolen' treasures of the 19th century Sikh Kingdom, those that are scattered around the world today. “My journey of collecting Sikh antiques began with discovering arms and armoury. Eventually, my interest in Sikh and Islamic arts led me to start collecting paintings and ornaments among other things,” says Davinder. It is difficult to put a number on his collection. But the artist says, that roughly 400-500 miniature and majestic pieces of Sikh Art are in his possession including the official receipt that confirms the transfer of the Koh-i-noor diamond from Sikhs to the UK. “This [receipt] is probably the closest we will ever come to getting back the Koh-i-noor from the British,” says Davinder. Up until a few years ago, Toor recalls that the receipt of the Koh-i-noor was in possession with Dr. John Logan, who was once the guardian of the Treasury of Citadel in Lahore. Over the years, the debate over the return of Koh-i-noor diamond has been a boiling pot in the UK-India relations. But, this diamond is only the tip of the iceberg in the long history of confiscation of jewels by the British Raj when it had colonised India. According to him, there were a total of 600 pieces of precious jewellery and ornaments that were confiscated from Maharani Jind Kaur by the British establishment when she had first come to London. She was the last and youngest wife of Maharaja and out of these 600 pieces, Davinder says, that merely four of them now exist out of which he has successfully located three of them. Now, Davinder shares the history of some 100 pieces of heritage that he has acquired in his forthcoming book 'In Pursuit of Empire: Treasures from the Toor Collection of Sikh Art, to be published by Kashi House in May. The book has a foreword from the Scottish historian William Dalrymple, and binds together vintage photographs of the darbars of Maharaj Ranjit Singh and is collated with in-depth research that sheds light into the integrated culture of the Sikhs. Back in the era of 1800s, the fledging Sikh empire was expanded by his highness Maharaja Ranjit Singh to the majority of the northwestern Indian subcontinent. This empire encompassed Pakistan, Afghanistan, Persia (Iran) and even parts of Tibet, countries that were carved out of the Sikh empire in the post-colonial period. “Through these objects I wanted to tell the story of the rise and fall of the Sikh empire. The ancient bygone civilisation of Sikhs was a melting pot that blended different cultures which is quiet evident in some of these paintings where the artists have captured the Persian verses to the Mughal culture,” says Davinder. Discussing his favourite oil canvass painting with a gold plated frame before us which portrays a group of thugs preparing to strangle a lone Sikh Warrior, Davinder speaks about integration and multi-cultural symbolism of the Sikh empire. “A lot of these artists were Hindus and Muslims but their subjects captured the Sikh legacy in great detail. It is only then that we realise that the Sikhs comprised of only 10% of the Punjab's population in those days,” Davinder discloses.